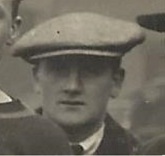 Jon Brown was essentially a reserve after joining Burnley from Great Harwood in December 1913. He played just one senior game for the club, replacing the injured Billy Watson at left half in a 2-1 win against Aston Villa at Turf Moor in February 1915. He was a fixture in the Burnley reserve side that finished fourth in the Central League in 1914-15 and was also in the Clarets’ reserve side that overcame Blackburn Rovers reserves 2-0 in the final of the East Lancashire Charity Cup in April 1915 at Turf Moor. He joined the 1st East Lancashire Regiment and was killed in action in November 1918, less than a week before the Armistice was signed.